Spectrem Group breaks down Outlook measurement by Millionaire and non-Millionaire households. The Millionaire Outlook showed an increase over March in every component, a reflection of these wealthy investors’ more long-term approach that helps them maintain their confidence among changes in the stock market or events that could impact the global economy, such as increased tensions in Ukraine. The Millionaire Outlook in April gained 7.18 points to 25.36, a five-month high. The Millionaire Outlook is up 10.61 points from April 2013. Household Income posted the biggest gain, 11.86 points, to 26.44. Household Assets increased 8.42 points to 44.44, another five-month high. Company Health gained 4.96 points to 19.98, a seven-month high, while the Economy ticked upward to 3.19. But the Non-Millionaire Outlook, which dropped 14.67 points to 6.46, was a drag on the overall Affluent Outlook, posting declines in each component. The biggest setback was in Household Income, which dropped 23.5 points to -0.77. Household Assets dropped 6.71 points to 20.56. Company Health declined 14.91 points to 2.24, while the Economy fell 13.59 points to 3.79. Year-to-year, the Non-Millionaire Outlook is basically unchanged. The Spectrem Affluent Household Outlook is a monthly measure of Affluent investor confidence in four financial factors that impact their daily lives. Three out of four of the components in the overall Outlook posted drops this month. Household Income fell 5.15 points to 13.15, while the Economy declined 4.69 points to 7.31, a four-month low. Company Health declined 4.43 points to 11.27. Household Income, though, ticked upward .75 of a percentage point to 32.78, a five-month high. 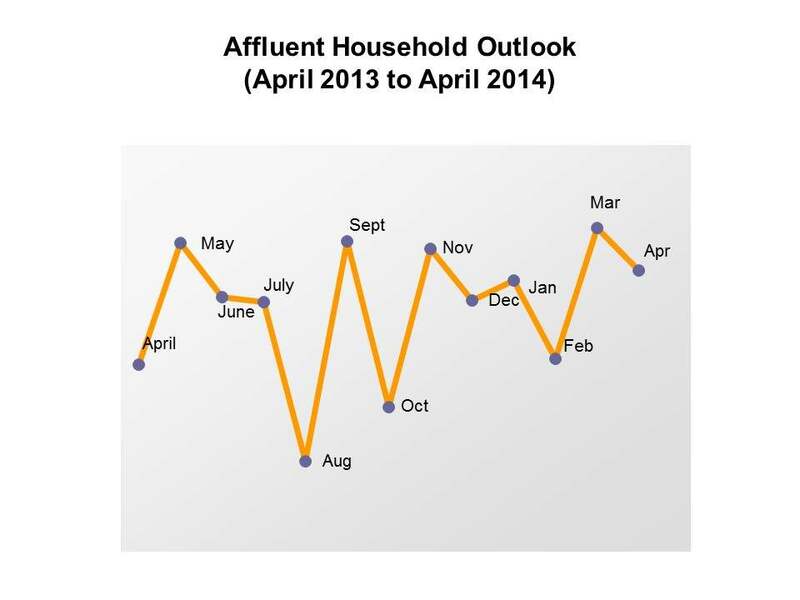 Year-over-year, the Spectrem Affluent Household Outlook is up 7.61 points since April 2013.